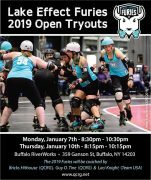 Since 2015, the Queen City Roller Girls have called the Buffalo RiverWorks Event Center their home. 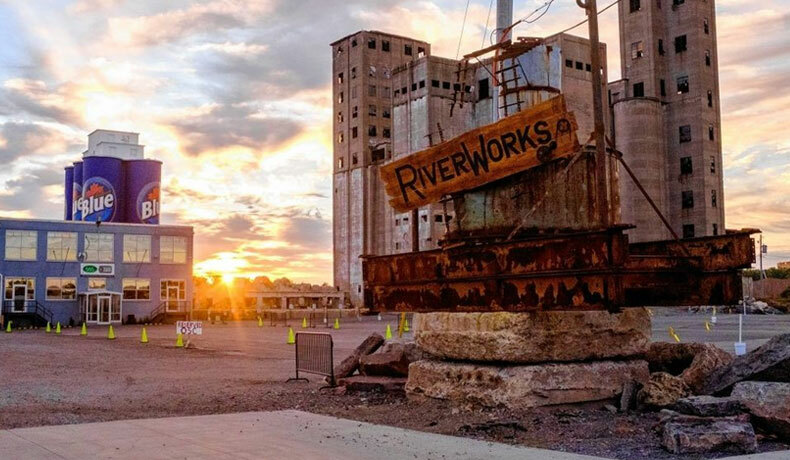 Located along the waterfront on Ganson Street, RiverWorks is one of the Buffalo Brewery District’s newest offerings, providing their own growing mix of hospitality and entertainment. Buffalo RiverWorks is an adaptive reuse of the former GLF grain mill operation and serves as a multi-purpose recreational and events center. The 60,000 square foot indoor event center features multiple bars and restaurants, a 5,000 person concert venue, a 1,500 person banquet facility, and space for trade shows, corporate events, and conventions. The 50,000 square foot covered outdoor ice rinks serve as a venue for ice hockey, roller hockey (in summer), box lacrosse, and curling leagues. All of this is located a mere half mile from Keybank Center and Canalside, along the Buffalo River. 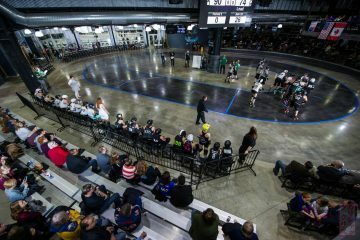 While most leagues in our sport use spaces like roller rinks and basketball/hockey arenas, we’re lucky enough to have a purpose built roller derby facility in RiverWorks allowing us provide an ideal viewing experience for our fans. Our move to RiverWorks has also allowed us to move to the city, ensuring that QCRG will play within the Queen City itself and to actively participate in the overall revitalization occurring downtown. Buffalo RiverWorks is located at 339 Ganson St., accessible via the the Michigan St. Bridge or from the south via Ohio St. It is directly across the Buffalo River from River Fest Park. We primarily have bouts on Fridays, Saturdays, and Sundays during our season, which runs from January to early June. How can I see a game? Tickets can be pre-purchased online, or at the door through the RiverWorks box office on gameday (beginning 1-2 hours before the game). Click Here for more details on seating and pricing. We spend most of our practice and scrimmage time at RiverWorks. These practices are open to spectators and fans, so you are able to see the effort our skaters put into improving their skills! What is the track surface? Polished concrete, with the track actually permanently surfaced; leveled, colored and textured to our specifications. The Subzero Sirens play against the visiting Tri-City Roller Derby. It’s Home Team playoffs! The 2nd and 3rd ranked teams will square off for a shot at the QCRG Cup Championship! The 1st seed plays the winner of 5/18’s Playoffs for the QCRG Cup Championship! Learn more about joining our Roller Derby Boot Camp! Wednesday, July 18th at 7:30 PM at Buffalo RiverWorks. Head over to our Recruiting Center for more general info.